The story of LogicielComptable.fr begins when Nicolas notices that his entrepreneur friends have difficulty choosing an accounting software among all the offers on the market. He then decided to create this site which includes a number of tips and tools for self-employed professionals or managers of small businesses. 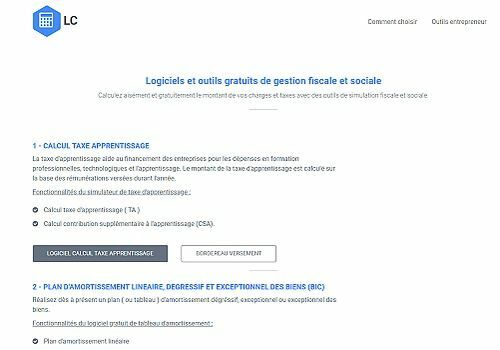 You will find online a set of free tools to ensure your tax and social management, starting with the calculation of the apprenticeship tax. This tax helps to finance companies that encourage training and apprenticeship. LogicielComptable.fr proposes to carry out a linear, degressive and exceptional depreciation plan for assets, or BIC. Also find out if you are eligible for the CICE, the tax credit for competitiveness and employment. This is actually a corporate tax reduction for professionals whose salaries do not exceed 2.5 times the minimum wage. A multitude of other tools are available, such as the corporate tax calculation simulator, or CT, which includes other evaluations such as the calculation of CT deposits, capital gains, as well as additional or exceptional contributions. Payroll taxes are one of the elements to be taken into account in accounting: you are subject to them if you are not subject to VAT on the total amount of your turnover. In some cases, you may pay a tax on reproduction and printing equipment. This applies if you import or manufacture one of these machines used to copy or print documents of all kinds. Of course the tool has features to calculate expense reports and convert VAT from gross to net. Finally, since the publisher has designed this tool for auto-entrepreneurs, LogicielComptable.fr also offers you the calculation of expenses for auto-entrepreneurs. The tool takes into account social security contributions, the contribution to vocational training, or the specific legal requirements of overseas France and Alsace/Moselle. Feel free to visit the site to discover the other functions of this tool.